Monzo vs. Starling Bank: Who's winning the mobile banking battle? 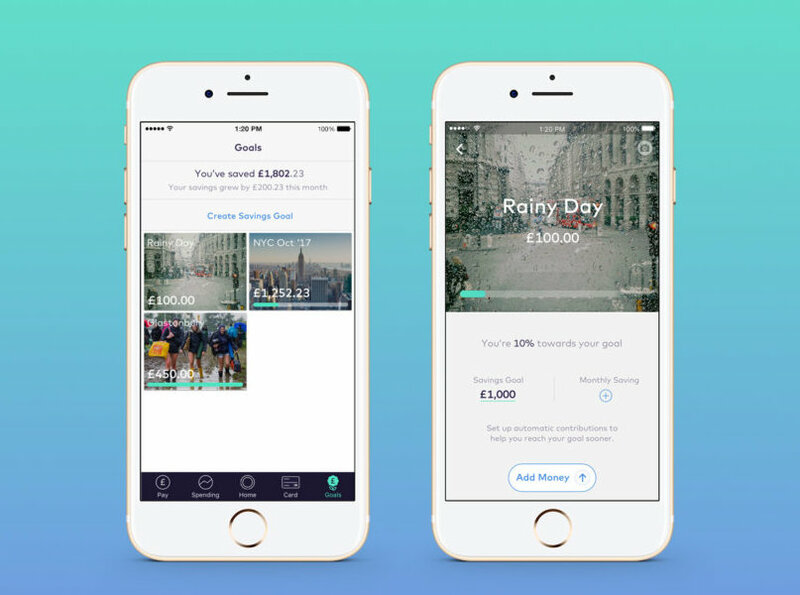 As challenger banks continue to reshape the banking landscape, it's still very much Monzo and Starling Bank that are leading the way for customers looking for great mobile banking experiences. Both are ranked as having "Amazing" scores by our reviewers, and Starling Bank won "Bank of the Year" at the 2018 British Bank Awards. But which bank offers the most? Is either of them worth switching to as your “main” current account? Read our thoughts below, and tell us what you think by leaving either of them a review. With current account switching volumes still relatively low, it’s imperative that the sign-up process is as smooth and frictionless as possible. With both banks, sign-up typically takes less than five minutes. Crucially, neither require any paperwork to be filled in, no forms need printing and posting via snail mail. It’s as simple as taking a photo of some ID, entering a name and address, and recording a quick verification video to prove your identity. Once up and running, the apps themselves require little in the way of “hand holding” as they’re both very self explanatory, and put the most common features front and centre. Adding funds and viewing transactions is as easy as can be expected. COULD BE IMPROVED: Perhaps it’s part and parcel of registration without paperwork, but we do have reports of users being unable to be identified on registration, which is obviously frustrating and leaves potential customers with a bad first impression. While both accounts are free — for now — that doesn’t mean they always will be. Monese infamously adopted a monthly £4.99 charge which didn’t exactly go down well with existing users following a free for life promise. Starling Bank customers receive 0.5% interest on current account balances up to £2,000 (0.25% thereafter up to £85,000) which is more than most banks. Monzo has yet to announce any interest rate incentive for current account customers. Funds held in both banks are covered by the FSCS up to £85,000. Monzo's overdraft comes with a 50p charge for every day your account is withdrawn, up to a maximum monthly charge of £15.50. The charge is the same regardless of how overdrawn your account is. The Starling Bank overdraft is 15% EAR. 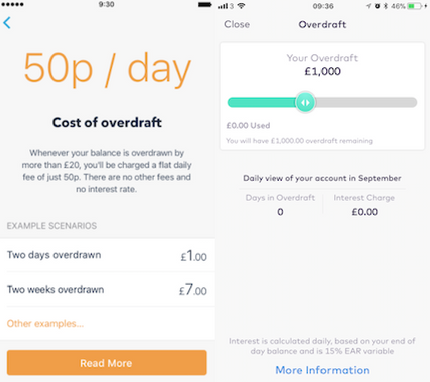 By Starling's own admission, this isn't marketing leading, but both banks have made special effort to be clear and transparent with regard to charging, and overdrafts are an important frontier for customers. Both have made it easy for the customer to better manage their overdrafts; just move the slider to set the size of your overdraft, and the cost updates immediately below. For Starling customers to be charged the same per day on their overdraft as Monzo customers, they'd have to be around £1,300 withdrawn. But many customers prefer the clarity and certainty of a fixed fee. they know exactly how much they'll be charged at the end of the month for their overdraft, unlike the often complicated calculations involved with EAR. When you use your card abroad, Monzo charges a 3% fee on cash withdrawals. Starling Bank, on the other hand, has made travel benefits a big part of their offering. They don't charge any fees for withdrawing money abroad (subject to fair use of £300 a day). What really marks both banks out pretty markedly from some of the other "new banks" is that both are trying hard to promote a culture of transparency, and honesty with customers, which so far, their respective communities seem to greatly respect. COULD BE IMPROVED: We'll have to wait and see how both banks evolve their fees and charges as the commercial realities of marketplace models won't be known for a while yet. It’s difficult to put the Starling Bank app and the Monzo app side by side and not see similarities in their approach - Monzo is of course, closely related to the origins of Starling Bank. So in terms of app usage, it may be a case of choose whichever you find easiest to use, or nicest to look at. They’re everything you’d expect in banks designed from the ground up — no legacy systems to hold them back, and a modern feature set making full use of a smartphones in-built technology like TouchID, real-time notifications for payments in or out, Google Maps integration, and more. Both apps offer good support for budgeting, but Monzo's features are still richer. 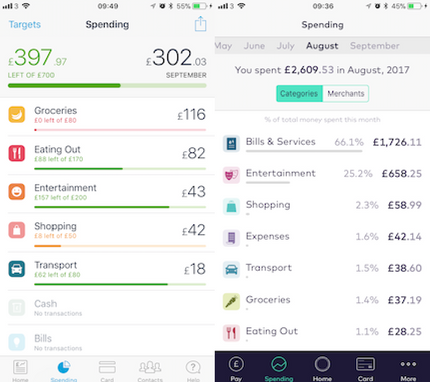 Both Starling and Monzo automatically categorise your spending and give you a clear picture of which retailers and merchants you've spent the most money with that month. Neither app lets you create your own spending categories, but you can manually re-categorise transactions. Monzo wins the budgeting battle because it lets you set specific budgets for different kinds of spending. When you're nearing or exceeding this limit, the app will let you know, but it won't actually stop you spending. Both banks also help you save by letting you segment your cash: Starling calls these "spaces" and Monzo calls them "Pots". Both features have their benefits. Pop your money in one of Starling's "spaces" and you'll earn 0.5% interest on it, while continuing to have immediate access to the money. However, Monzo's "pots" offer a wider range of features. You can open a pot called a "Coin Jar", which rounds up your purchases to the nearest pound and pops them in a savings account, much like apps such as Moneybox. You can also schedule payments in and out of your Monzo pots. That means you can tuck away your rent when you get paid, and then schedule it to move back into your main account on the day your rent is due. Monzo's pots don't offer interest yet, but they plan to launch a special one that pays interest on savings over £1,000. Starling’s future lies in its marketplace, which allows you to integrate your Starling app with third-party financial services providers, such as PensionBee, Wealthsimple and Habito. This feature could be the future of Starling, allowing its users to seamlessly view their entire financial life from a single app. COULD BE IMPROVED: Both apps are going to have the occasional glitch, which is fine, but when they leave “beta” they’d better be rock solid. Both apps take a chat-first approach to customer service, via a customer service tab. 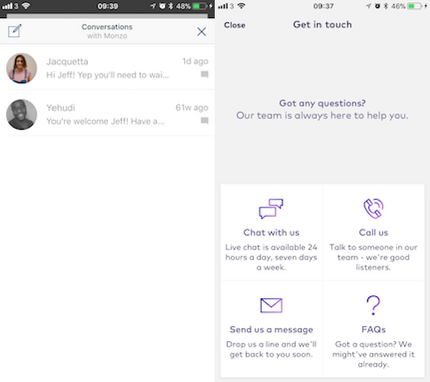 And while both banks offer support via telephone, Monzo certainly do their best to push customers to in-app chat first, whereas Starling Bank encourage customers to call for more complex queries. Customer service takes a modern approach overall, with both using emojis and an almost overly friendly disposition to “soften” the approach, but for day to day queries, chat is a useful way to solve simple queries without moving from the sofa. We’ve also seen both banks offering little freebies to customers, ranging from tee-shirts for spreading the word about Monzo, to chocolates for Starling Bank customers who’ve had app teething problems. If customers don’t mind losing face to face interaction, expect app-based chat to become more and more commonplace. Both companies have always valued the input of their customers, and they've consistently demonstrated a meticulous understanding of their audiences. When they launched, both ran forums, allowing customers to offer feedback and suggestions. But in September, Starling closed their forum, explained it hadn't "worked out the way [they] would have hoped". Monzo's community focus continues to thrive. 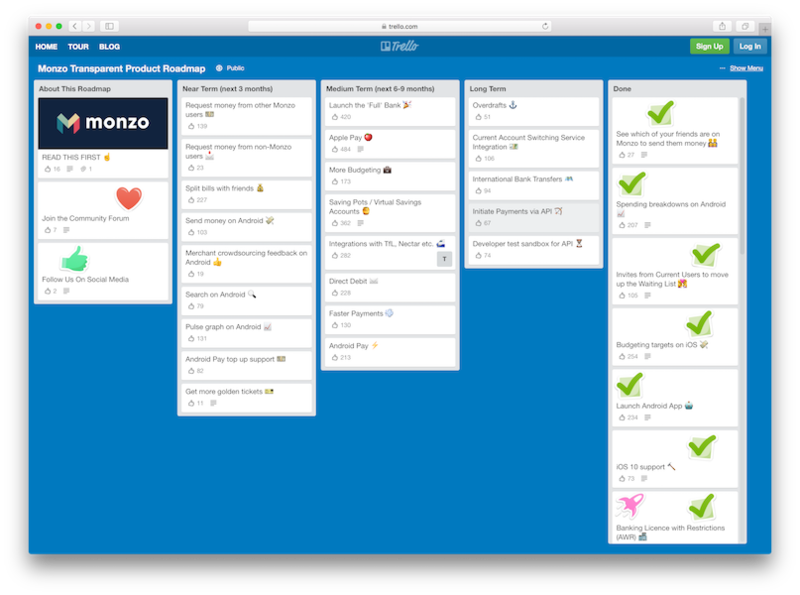 As well as running their forum - which has more than 20,000 active users - Monzo encourages its users to organise meet-ups, focusing on topics like app development and creating your own podcast. They supports these events by offering merchandise, promoting it on the community forum and sending members of the Monzo team. COULD BE IMPROVED: While the method of contacting customer service has changed, the security questions, and script-like nature of some customer service queries has not. A truly personal and approachable customer service is no doubt difficult to achieve when everyone is slightly different, but as both banks pass the app hygiene test, it's clear that customer service could be the real battle ground going forward. 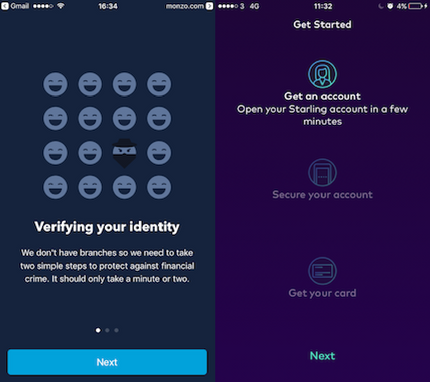 Since starting out with its current account, Starling Bank has also launched joint accounts and business accounts. Whether Starling's product range will continue to develop will have a big impact on the bank's future. The same goes for Monzo, although they currently offer just the current account. One area where Monzo is probably beating most companies in the UK is in transparency. They publish A LOT publicly, be it the number of current accounts actually opened, or their entire page dedicated to transparency including investment ethics, diversity, and plenty more. And they're continuing to redefine the role of the customer community in banking. It will be exciting to see how they develop their relationship with their remarkably passionate audience. Either way, it’s going to be interesting watching the Starling marketplace develop, and to see what new functionality Monzo might add to attract new customers and to retain existing ones, who might look to jump to the next shiny app that may be just around the corner. It’d be hard to choose a winner between the two when they’re both the clear leaders in a frontier that will only become more competitive. We wouldn’t be surprised if they were feverishly "borrowing" ideas from one another, and as long as the output is better than what the big banks of today are managing, then it should result in a win-win for customers too. But if you’re at all intrigued as to whether these new banks can offer something a little more exciting than your existing bank, dive right in and see what they’re about. We're excited to see how they perform at the British Bank Awards 2019, for which voting opens on Monday. Are you already using Starling Bank or Monzo? Help others decide whether these banks are worth switching to by sharing a Monzo review or a Starling Bank review today!